Whether you call them Bounce Houses, Jumpers, Moon Bounce, Moon Walks, Bouncy Castles, Inflatable Party Rentals, Etc... We've got them for rent in the Atlanta area! For more than twelve years, Jumping for Joy Moonwalks, Bounce Houses & Party Rentals has been providing quality equipment and entertainment for families, churches, schools, and corporate events in the Northwest Metro Atlanta area. We have provided outstanding service to Marietta, Kennesaw, Woodstock, Canton, Dallas, Cartersville, Sandy Springs, Acworth, Powder Springs, Cobb County, Paulding County and much more! It is our goal to make your event a fun and memorable one. 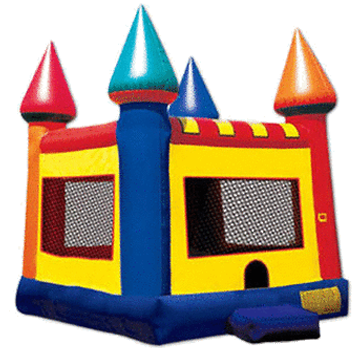 Jumping For Joy strives to provide prompt delivery of clean and well maintained inflatable party rentals in Atlanta in order to satisfy your entertainment needs. Free Delivery For Cherokee, Cobb & Paulding Counties. For deliveries to other areas please call or contact us to confirm. Pictures are not to scale. Please refer to the measurements for size and dimensions.